Drivers that just happen to be in the wrong spot (distance from Stop Line) when a light changes yellow will experience worse case hardest braking, or run the light. Worse case distance (the wrong spot) depends on speed, yellow light duration, vehicle length, and the Intersection Threshold (Clear) Line position. Worse case distance is the same for every driver, braking depends on driver reaction time. intersection threshold line - depends on locality. A line, real or imaginary, that defines the start of the controlled intersection. 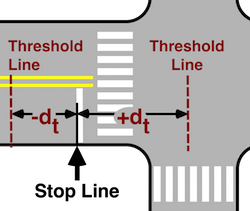 The intersection threshold is perpendicular to traffic flow, located on the lanes facing the traffic signal, and its position in those lanes is defined by local law. 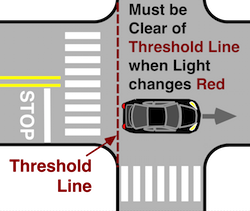 The above example places the Threshold Line at the start of the intersection as defined by the Manual on Uniform Traffic Control Devices published by the US Department of Transportation Federal Highway Administration. The manual defines the start of an intersection as the extension of the cross traffic curb line. The entire vehicle must be passed the Threshold Line (sensor coverage area) when a signal light changes from yellow to red. An incident at a controlled intersection whereby any part of a vehicle extends past the intersection threshold while the traffic signal is displaying a red phase to the operator of such vehicle. A vehicle cannot enter or be on the intersection threshold line (clear line) when the light changes red, and the red light must be visible to the driver. The line is always perpendicular to traffic flow. The Threshold line's position depends on local law. The worse case distance can be accurately calculated, and is the same for every driver. 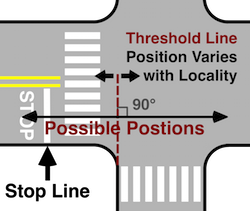 Determining the distance between the stop line and intersection threshold line varies with locality and may require some research. In some instances the government entity responsible for the intersection will post red light camera data, including threshold and stop line locations, on the Internet. When the threshold line is before (in front of) the Stop Line, the distance between the threshold and stop lines is negative ( -dt ). EXCEPTION: If the Threshold Line is before the Stop Line (-dt), and the distance between stop and threshold lines is greater than the vehicle length, then vehicle length is not a factor and L equals zero in the equation (L = 0). If |-dt| > L , then L = 0. Braking depends on driver reaction time and road grade. Different states use different driver reaction times for braking calculations, from as short as 1.0 second up to 2.5 seconds. Overall average reaction time for all driver types is 2.3 seconds. Braking deceleration is change in speed with time, Common measuring units are feet per second second (ft/s2), meters per second second (m/s2), and miles per hour per second (MPH/sec). Braking rate is also commonly measured in "g's" - acceleration compared to acceleration due to gravity (g = 32.174 ft/s2). The "g's" is not force, it is a comparison of an object's acceleration to a free falling object acceleration (21.9 MPH/sec). Also see Acceleration Parameters. If |-dt| >= L , then L = 0.
ty = yellow light duration. tr = driver reaction time. dt = Distance from Stop to Threshold Line. (2) Vehicle length variable (L) is 0 if Stop to Threshold distance is greater than or equal to vehicle length ( |-dt| >= L ). (5) Stop to Threshold Distance (dt) is negative (-) if the Threshold Line is before (in front of) the Stop Line. (6) Road Grade is negative (-) for downhill. Many communities use red light cameras as a revenue source, then claim it is for safety. Some places go so far as to shorten the yellow duration forcing more drivers to run the light. To make matters worse many states use an unrealistic (fast) driver reaction time to determine yellow light duration. Another reason for short yellow time is the intersection was changed, lanes added or speed limit changed, but the intersection stop light was never adjusted. longer yellow light duration lowers braking action (safer stops). some drivers aware of a camera brake too soon and get rear-ended. person vehicle registered to may not have been driving. evidence against vehicle, not driver (no direct evidence against owner). cannot cross examine electronic circuits (loss of right to confront witness). sometimes the yellow duration is decreased (more tickets and more dangerous). up to half of fine can go to a 3rd party (private company that maintains system). some contacts forbid increasing (making safer) yellow duration. Any measuring device, especially automatic devices (speed and red light cameras), should have established tests (calibrations and/or laboratory test) scheduled on a regular basis. Test records should be maintained and available. Any device not tested and maintained properly has questionable accuracy. Also the chain of control of evidence (photos and data) should have checks and balances with accountability and be well established and followed. © Copyright 2005 - 2017, All Rights Reserved.